The activities on this page are designed to actively involve students in using place value concepts to build numbers. Number Line-up, Build a Number, Decimal Build a Number and other place value games help students develop a strong concept of place value. See more place value activities: Place Value Activities include the School Day Count routine, place value game, and Who Has? more or less and base ten decks. These problems were designed to introduce second grade students to open-ended assessment tasks. Prompted questions will help students learn how they should respond to these types of questions. Scaffolded support includes these bulleted questions, organizing charts, etc. to help students organize their responses. Supports are gradually withdrawn so that students eventually receive the open-ended assessment question only and must organize and full respond on blank paper. Problem sets were created so that teachers may elect to use one problem for class discussion and the second problem for independent student work. Favorite Pets requires students to analyze the information in a tally chart of students' favorite pets. Favorite Ice Cream requires students to analyze the information in a tally chart about chocolate and vanilla ice cream. Bay Street requires students to analyze the pattern of house numbers on Bay Street. 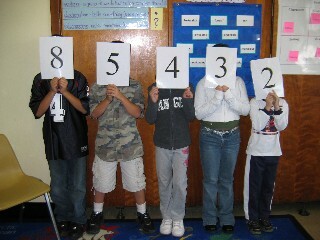 Students write down the pattern they see and use this number pattern to write in the missing house numbers. King Street requires students to analyze the pattern of house numbers on King Street. 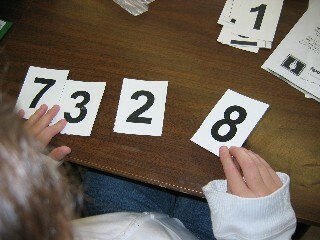 Students write down the pattern they see and use this number pattern to write in the missing house numbers. Saving Money-1 requires students to analyze the pattern in saving money to decide if the student will have enough money to buy the new CD she wants. Saving Money-2 requires students to analyze the pattern in saving money to decide if the student will have enough money to buy the new DVD he wants. Big Number-1 requires students to arrange the digits to form the largest 4-digit number possible and explain how they know they have formed the largest number. Big Number-2 requires students to arrange the digits to form the largest 4-digit number possible and explain how they know they have formed the largest number.